Learn to hunt in your backyard. One of the best locally grown and foraged foods is, without doubt, venison. It is a healthy, delicious protein source. And, in areas where the deer herds are dangerously overpopulated, hunting is a good way to help protect the environment (overpopulated herds damage the entire ecosystem by eating food that other woodland creatures need and by eating all new forest growth, thus disrupting the natural cycle). Today I came across an article on Zester Daily about the blood trail of vegetarian and vegan foods, and I thought there is another reason to eat local meat! I had never considered what it takes to grow soybeans and other vegetarian staples, although I should have…deer and other animals eat crops. Farmers need to control the damage so they exterminate the animals. And none of that meat goes toward feeding people. It is simply a waste of life. I don’t feel good about that. 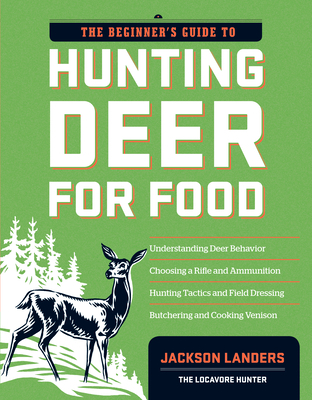 Jackson Landers wrote a book on hunting for beginners that looks great. I’m going to order it just to support Jackson, and to show to all my friends who have recently expressed an interest in learning to hunt. If nothing else, it is great food for thought.